Adhesives, Instant Adhesives, Super Glue, Instant Bond, Instant Adhesive, Glue, Electric Tape, Cynoacrylate Adhesive, Bond as an active Manufacturer, Supplier, Dealer, Distributor, Trader and Seller etc. (*Importer/Exporter/Service Provider). 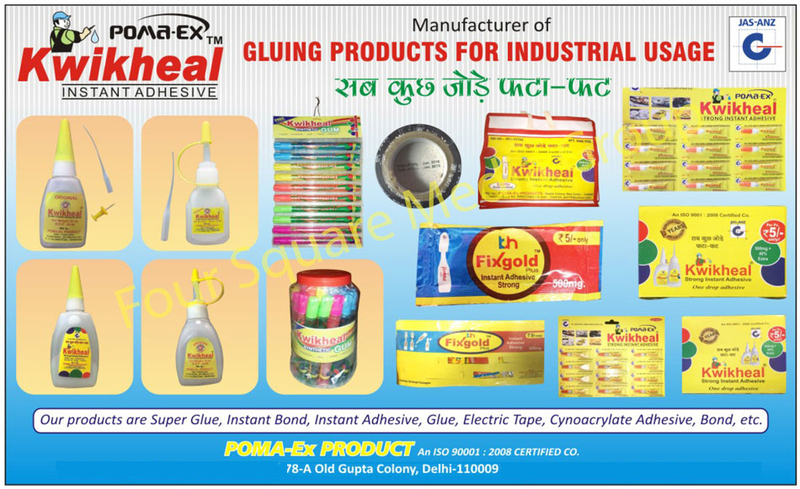 Find a broad range of superior quality instant adhesives in Delhi here at Poma-Ex Products. Poma-Ex Products is an ISO 90001:2008 Certified Company known as a leading instant adhesive manufacturer, supplier and trader in Delhi. Our adhesives range is very useful for sealing numerous broken stuffs instantly. The quality of our adhesives is remarkable as it is manufactured and afterward undergoes various checking process supervised by experts. Hence, we are capable of meeting the client's all kinds of Instant Adhesives needs in a very sophisticated manner. Our products line is available in different shapes & sizes and is very economical in nature.